In determining how temperature can affect wood moisture content (MC), there is a connected set of conditions that must be considered in order to really understand the role that temperature plays in the process. If you’re looking at the wood’s corresponding dimensions, there is another step to consider. Temperature can change wood drying time (the time to remove excess MC). Temperature and relative humidity (RH) influence wood MC. Changes in wood MC can lead to changes in the physical dimensions of wood. Therefore, the temperature has an impact wood’s physical dimensions. However, a closer look reveals a frequent misunderstanding in that line of reasoning. While temperature and RH are necessary to calculate equilibrated moisture content (EMC), temperature changes have a much lower degree of impact on MC readings than changes in relative humidity do. Temperature’s impact on wood MC lies in the fact that it directly influences ambient RH, or the surrounding air’s ability to “hold” water in its vapor form. 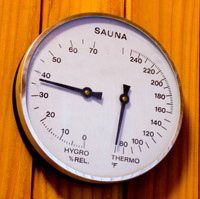 It’s RH that has a greater influence on wood moisture measurement. How can we tell? If a wood sample is in an environment where the temperature rises or lowers but the RH level stays constant, the change to the moisture measurement will be almost negligible. If, however, the temperature remains constant but the RH rises or falls, the moisture measurement readings will also rise and fall accordingly. There are numerous examples of this process, but try this: find an EMC table and trace along a row of data where the RH stays constant. Then, try the same example using a column where the temperature remains constant and see how the RH changes significantly. Why does RH have a greater impact on MC than temperature? As a hygroscopic material, wood is in a constant state of reacting to its environment. If the moisture level in the air is higher than it is in the wood, it will absorb moisture from the air until they are in balance. The reverse is also true – wood will release moisture into a “drier” environment until it is in balance. If that shift is too sudden, cracks, warping, and other problems can occur. As has already been pointed out, it’s RH that significantly changes wood MC. It leads the moisture dance in wood. EMC is the balance point between ambient conditions (temperature and RH) and the wood. Establishing the correct EMC for a floor can be quickly and easily determined with our Wood H2O app, and is the best preventative step to ensuring an accurate and durable installation. EMC is not a fixed number but will minimize seasonal shifts and ensure the floor’s best performance under current conditions. Allowing time for a wood flooring to adjust to its unique environment’s relativity humidity (influenced, of course, by the temperature) is the best way to ensure that the finished floor will not develop internal moisture-related problems during service. How can that happen? Wood’s physical dimensions can be directly affected by its MC levels. During its natural give-and-take process with surrounding RH, the wood cells and fibers can take in enough moisture to swell or lose enough moisture to shrink (it’s a process similar to a sponge, although usually on a slower scale). If wood flooring has not properly acclimated to the job site, this natural process can lead to gaps, buckling, crowning, splits or other problems in the finished floor. It’s worth pointing out again that this is directly connected to ambient RH, and not directly to temperature. Understanding the interaction between temperature, RH and wood MC is only half the equation when taking wood moisture measurements. The other half lies in understanding how different moisture meter technology is affected by temperature (among other factors). It’s important to realize that it may be the meter being impacted by the temperature, and not the actual MC. Here’s why: Accuracy is dependent upon knowing the impact that temperature will have on the meter itself, not just the wood. Pin-style wood moisture meters, by nature of their technology, are more susceptible to the temperature of wood. Pin meters take MC readings by passing a small electrical current between the pin tips, and the resistance is translated into an MC reading. As wood temperature increases, its electrical resistance decreases and the MC reading will change accordingly. In order to correct for this temperature-related skew, corrections are necessary to ensure the accuracy of the actual MC. For the most accurate results, if using a pin meter, always follow the moisture meter manufacturer’s correction factor recommendations. 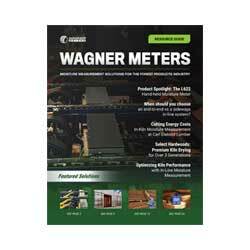 Pinless wood moisture meters, like our meters here at Wagner Meters, do not rely on the wood’s electrical resistance to determine wood MC and so, except in extreme conditions, do not require the same correction factors for temperature. As we demonstrated above, the temperature has less impact on wood MC that RH does, so our meters do not require appreciable corrections for temperature when measuring MC. Even RH does not significantly impact MC readings unless condensation is allowed to form on the meter’s sensor. 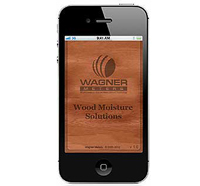 Our IntelliSense™ technology sees past surface moisture to accurately measure MC in the wood. The end result is this: When it comes to temperature, understanding the role it has in influencing the job-site RH, the wood MC, and the performance of your moisture meter is the best insurance to preventing moisture-related problems in wood flooring. With the combination of our pinless wood moisture meters and our free Wood H2O app, we take any guesswork out of the equation. I have a quick question. We are forming some plastics using a wood mold. How much affect does a wood mold have in forming our product? Thank you. I’m not entirely sure how we can be of help. Can you provide some more information as to what you’re working on? Please feel free to give Customer Service a call at 1-800-634-9961 to provide additional information. Thanks!